Information technology firm T-Rex Solutions has again attained a level three capability maturity model integration rating after an assessment of the firm’s development and services. The rating, initially awarded three years ago, now has an extended validity covering up to 2022 and supports requirement compliance for multiple U.S. government contracts, the company said Tuesday. 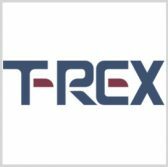 “This assessment required interviews with technical and business support team members demonstrating our processes as well as access to over 1K collected artifacts,” said Seth Moore, chief operating officer at T-Rex Solutions. The rating adds to the company’s ISO 9001 certification with the International Organization for Standardization.